"Assassins" lays bare the lives of nine individuals who assassinated or tried to assassinate the President of the United States, in a one-act historical "revusical" that explores the dark side of the American experience. From John Wilkes Booth to Lee Harvey Oswald, writers Stephen Sondheim and John Weidman bend the rules of time and space, taking us on a nightmarish roller coaster ride in which assassins and would-be assassins from different historical periods meet, interact and inspire each other to harrowing acts in the name of the American Dream. Loud. Nearly every cast member singing (or screeching) at the top of their lungs. Piercing flute lines in the accompaniment. Lines shouted as often as spoken. Does it enhance "Assassins?" Not particularly. The energy is appreciated, but not the overblown, alienating bombast that predominates. 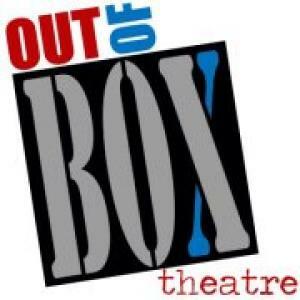 Director Michelle Davis has purportedly chosen a circus theme for Out of Box’s production of "Assassins." We have someone in a ringmaster costume, a few others in garb that marginally suggests denizens of a sideshow, and others that just look odd in Ali Olhausen’s costumes. The set suggests the center ring of a circus by having a painted circle in red, white, and blue containing a border with thirteen stars. Boxes making up most of the rest of the set are nicely painted in similar style, and Morgan McCrary Brooks’ design also includes an electric chair that doubles as a vehicle. Stevie Roushdi’s lighting design uses red lights for atmosphere, but doesn’t always illuminate the section of the stage where performers are emoting. Most of the show, though, uses adequate general lighting. Sound, designed by Paige Crawford, plugs in frequent gunshots, unaccompanied by any stage magic to show the effects of the shooting. "Unworthy of Your Love" is often one of the highlights of the show. Here, it’s not. The weak voices and listless performances of Julianne Whitehead and Jack Allison render it forgettable. Charles Guiteau’s solo is often another highlight, and Kiernan Matts certainly makes it memorable here, but not in a good way. His overwrought yelling and look-at-me-do-high-kicks choreography in skin-tight leather pants goes so over the top that the song becomes the nadir of the show. There are good elements in the show. Emily T. Kalat does wonderful movement work as an articulated doll and hits all the comedy in her role. John Coombs sounds wonderful when he sings and gives a heartfelt (if perhaps overwrought) monologue about work in a bottle factory. Stephen Devillers sounds great and scores dramatically in the climactic scene in the Texas book repository, in which Jeremy Cooper’s acting surpasses any other in the show. Lauren Rosenzweig’s turn in the ensemble can’t dim her star quality. Annie Cook’s musical direction has gotten the cast to work in splendid harmony in multi-part vocal lines. Her keyboard playing is also spot-on. The accompanying woodwinds occasionally overpower, but the musical numbers sound good when the vocal range of a number matches that of the performer. That doesn’t always occur, with some fine singers (Joel W. Rose, for instance) sounding a little rough around the edges of a song’s range.